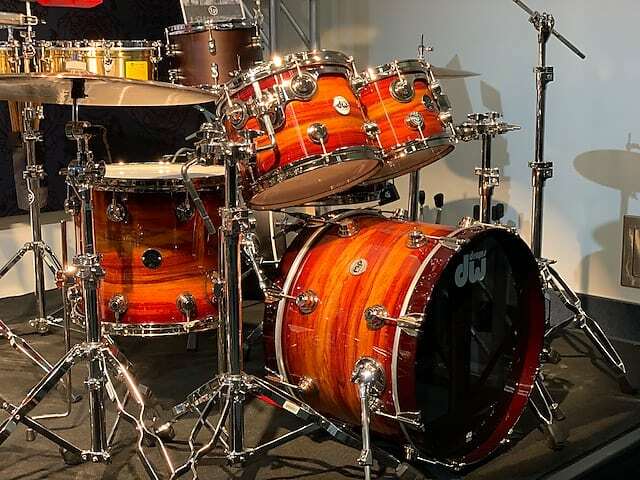 DW Santa Monica 10,12,15,20,6.5 NAMM drum set 2019 Padauk. Think Camco! UPDATE NOTE: THIS KIT SOLD IN 24 HRS. BUT, I HAVE THE LAST 5 PADAUK KITS ORDERED. THREE SETS ARE 8x12, 14x14, 14x20, 5.5x14 for $5070 each. ONE SET IS 8x12, 14x14, 14x18, 5.5x14 for $4845. AND ONE SET IS 9x13, 16x16, 14x22, 6.5x14 for $5400. NO MORE PADAUK WILL BE MADE AFTER THESE. CONTACT ME TO PRE ORDER THESE NOW. I purchased this at NAMM and it can be yours. A truly amazing set. And, this one is finished in an outer ply of ultra rare Padauk. VERY FEW SANTA MONICA SERIES SETS WILL BE MADE WITH PADAUK. 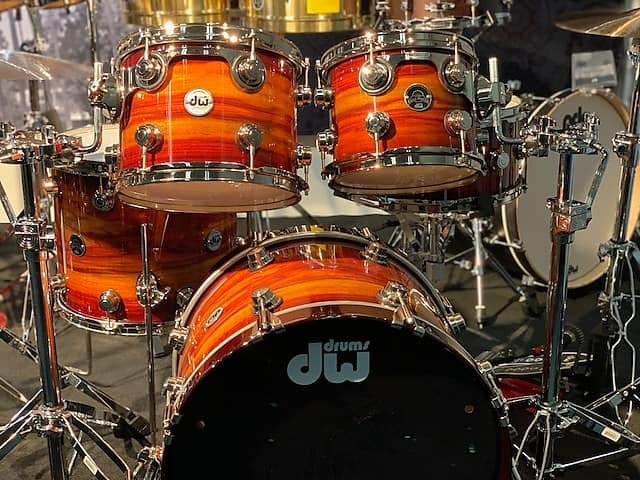 The Santa Monica series is a brand new shell design from DW that emulates LA era Camco kits. This includes thicker individual plies of maple for a denser, fatter sound with more wood and less glue. The re-rings are 6 ply vs. the standard 3 ply on current Collector's series kits. 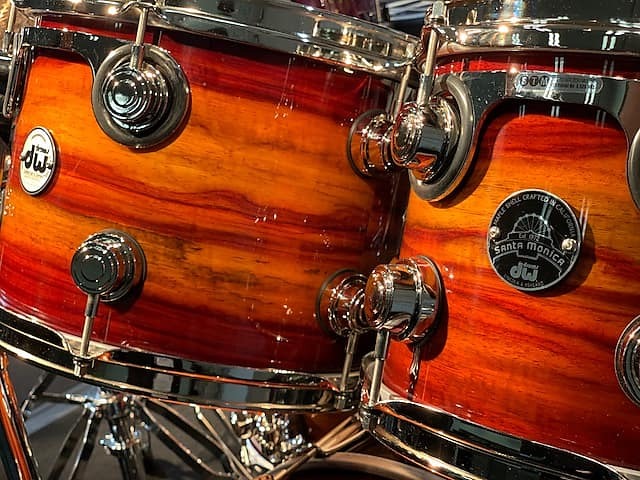 The drums are all maple and have a phenomenal note and projection. 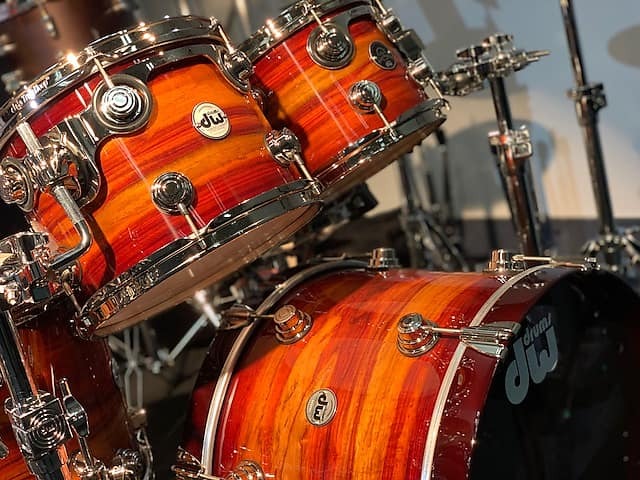 This set has an incredible outer ply of rare Padauk, along with nickel hardware. Sizes are 8x10, 9x12, 13x15, 14x20 and 6.5x14. People are literally drooling over this set at the show! For me personally, this series is an incredible one and I thank John Good and the team at DW for bringing this wonderful “Camco-like” sound back to life! This is a set that you will treasure for decades to come. Based on purchase price of $6,900 at 10% APR for 12 months. Excludes tax and shipping fees, to be calculated at checkout. Rates range from 10-30% APR. Choose from 3, 6, or 12 monthly payments.